Commuting is periodically recurring travel between one's place of residence and place of work, or study, and in doing so exceed the boundary of their residential community. It sometimes refers to any regular or often repeated traveling between locations, even when not work-related. A distinction is also often made between commuters who commute daily or weekly between their residence to work place, and are therefore considered respectively local or long-distance commuters. The word commuter derives from early days of rail travel in US cities such as New York, Philadelphia, Boston and Chicago, where, in the 1840s, the railways engendered suburbs from which travellers paying a reduced or 'commuted' fare into the city. Later, the back formations "commute" and "commuter" were coined therefrom. Commuted tickets would usually allow the traveller to repeat the same journey as often as they liked during the period of validity: normally, the longer the period the cheaper the cost per day. Before the 19th century, most workers lived less than an hour's walk from their work. Today, many people travel daily to work a long way from their own towns, cities, and villages, especially in industrialised societies. Depending on factors such as the high cost of housing in city centres, lack of public transit, and traffic congestion, modes of travel may include automobiles, motorcycles, trains, aircraft, buses, and bicycles. 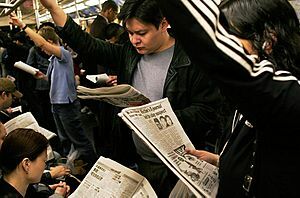 Where Los Angeles is infamous for its automobile gridlock, commuting in New York is closely associated with the subway; in London and Tokyo and several European cities, "commuter" is automatically associated with rail passengers. In the near future there may be another move away from the traditional "commute" with the introduction of flexible working. Some have suggested that many employees would be far more productive and live healthier, stress-free lives if the daily commute is removed completely. Commuting has had a large impact on modern life. It has allowed cities to grow to sizes that were previously not practical, and it has led to the proliferation of suburbs. Many large cities or conurbations are surrounded by commuter belts, also known as metropolitan areas, commuter towns, dormitory towns, or bedroom communities. The prototypical commuter lives in one of these areas and travels daily to work or to school in the core city. As urban sprawl pushes farther and farther away from central business districts, new businesses can appear in outlying cities, leading to the existence of the reverse commuter who lives in a core city but works in the suburbs, and to a type of secondary commuter who lives in a more distant exurb and works in the outlying city or industrial suburb. A UK study, published in 2009, found that women suffer four times as much psychological stress from their work commute than do men. Institutions that have few dormitories or low student housing populations are called commuter schools in the United States. Most commuters travel at the same time of day, resulting in the morning and evening rush hours, with congestion on roads and public transport systems not designed or maintained well enough to cope with the peak demands. As an example, Interstate 405 located in Southern California is one of the busiest freeways in the United States. Commuters may sit up to two hours in traffic during rush hour. Construction work or collisions on the freeway distract and slow down commuters, contributing to even longer delays. Cars carrying only one occupant use fuel and roads less efficiently than shared cars or public transport, and increase traffic congestion. Commuting by car is a major factor contributing to air pollution. Carpool lanes can help commuters reach their destinations more quickly, encourage people to socialize, and spend time together, while reducing air pollution. Some governments and employers have introduced employee travel reduction programs that encourage such alternatives as car-pooling and telecommuting. Some are also carpooling using Internet sites to save money. Alternatives like personal rapid transit have also been proposed to reap the energy-efficiency benefits of a mass transit system while maintaining the speed and convenience of individual transport. Traffic emissions – such as from trucks, buses, and automobiles – also contribute. Airborne by-products from vehicle exhaust systems cause air pollution and are a major ingredient in the creation of smog in some large cities. The major culprits from transportation sources are carbon monoxide (CO), nitrogen oxides (NO and NOx), volatile organic compounds, sulfur dioxide, and hydrocarbons. (Hydrocarbons are the main components of petroleum fuels such as gasoline and diesel fuel.) These molecules react with sunlight, heat, ammonia, moisture, and other compounds to form the noxious vapors, ground level ozone, and particles that comprise smog. 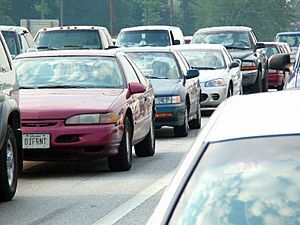 In the United States, the Census Bureau's American Community Survey (ACS) collects data on commuting times, allowing an analysis of average commute time by industry, location, and vehicle. According to the 2014 ACS, the average commute time for adults in the United States was 26.8 minutes. The occupations with the longest commutes were Construction and Mining (33.4 minutes), Computer Science and Math (31.8), and Business Operations Specialists (30.2), while those in the military had the shortest commute (21). In general, urban and suburban workers in the US have similar commute times (about 30 minutes), while rural workers have significantly shorter commutes (22.6 minutes). In the US, over 90% of workers commute by car, while about 5% commute by public transportation. Statistical models indicate that in addition to demographics and work duration, commute time is one of the most important determinants of discretionary time allocation by individuals. Commuting Facts for Kids. Kiddle Encyclopedia.